For the better part of two centuries, at least, the story of the Jersey Devil has been part of the culture of Southern New Jersey. A fire-breathing monster with the head of a horse, bat wings and the body of a kangaroo, the creature is said to be the thirteenth child of Mother Leeds, born in 1735, when the unfortunate woman put a curse on her future offspring. Informed at a tender age by his BeBop (his grandmother) that he is distantly related to the beast, Bill Sprouse goes looking for the story behind the story of his family’s connection to the famous monster. The result is part memoir, part travelogue and part a raucous tour of three-hundred years of New Jersey history. 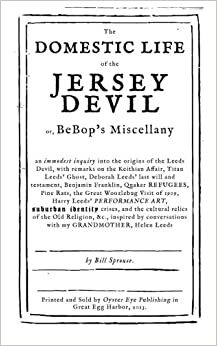 The Domestic Life of the Jersey Devil traces the origins of the Jersey Devil legend to an obscure pamphlet war that sent the Leeds family to Leeds Point at the end of the seventeenth century, with the family patriarch, Daniel Leeds, branded “Satan’s Harbinger” in the process. It follows the story through its connection with the residents of the Pine Barrens (the famous Pineys), who were said to live in fear of the beast, and, finally, it examines the legend in its modern iterations: X-Files episodes are made about the monster, a pro hockey team is named after it, and residents of Galloway Township attempt to adopt the creature as the Official Town Mascot. The Domestic Life of the Jersey Devil is a book about suburban identity, and about one suburbanite’s attempt to come to terms with his family history in the most unlikely of places.